Home » Parents, Don’t Leave For Your Flight Without This! JetKids BedBox – Travelling as a family with young kids can be stressful no matter how experienced or how well-behaved your children are. The unfamiliar surroundings, the strangers, the waiting time, it all can take its toll on even the most well behaved junior. Like most parents, I, too spend a lot of effort trying my best to ensure their flight (or mine rather) experience is as comfortable as well. I am quite the crazy mom, I bring heaps of toys, snacks, drinks, books, anything that could possibly take their mind of any form of mischief. 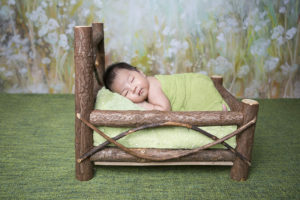 When the team at MyMiracleBaby reached out to test to give the JetKids BedBox a trial, I was more than happy to give it a go. The BedBox from JetKids is 3-in-1 suitcase that weighs only 3kg. It is a carry-on luggage, ride-on suitcase and bed / legrest (depending on how tall your child is). That sounds quite handy but the big question was, is the JetKids BedBox going to be useful enough to justify taking an extra piece of luggage with us on any trip? Read on as I share the positives and the negatives of this product. I hope that my honest feedback about this product will help you to decide whether it is the right one for your family. Meet Daniel, my eldest, who had the privilege of giving this a go. 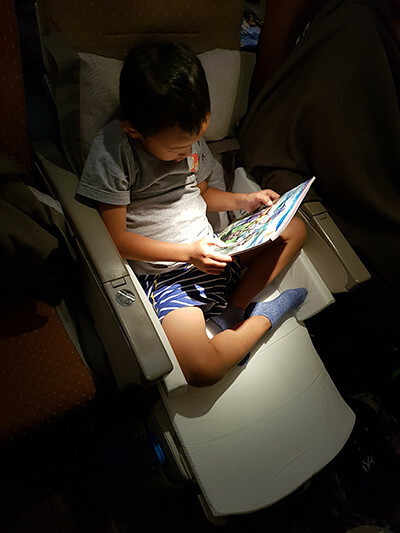 He’s 4 years old and 110cm, and our test flight was on Singapore Airlines from Singapore to Melbourne, with a flight time of 7h 45mins. As we’re flying with kids, naturally, the flight we chose was an overnight flight. 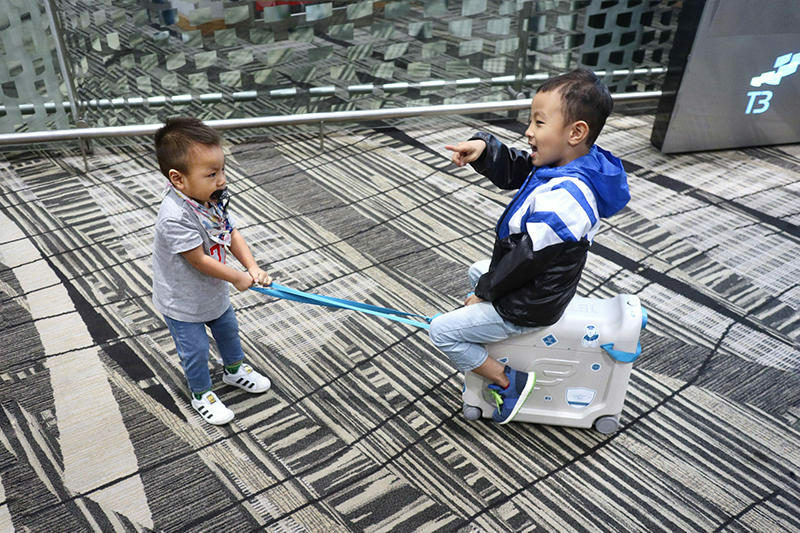 Ride-on suitcases are one of the most popular travel gadgets ever made for children, and are sold in their millions each year. 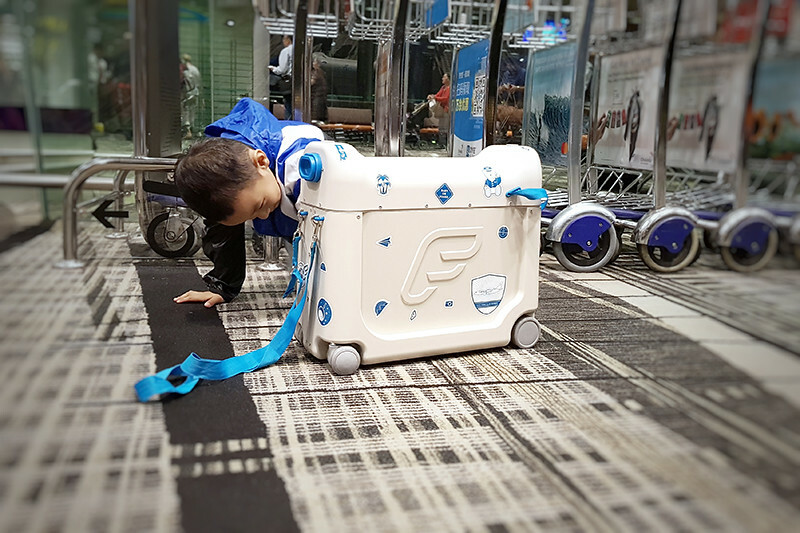 This is Daniel’s first ride-on suitcase and he had SO MUCH fun riding through Changi Airport’s Terminal 3. I enjoyed the experience too because he just sat and let me drag him everywhere without whining or complaining. When my hands were full, he just rode on his own. It was also very safe. At sharp turns, the JetKids BedBox held my kid well and it didn’t topple over. Nathen, aged 1.5, also enjoyed pulling Daniel through the airport. 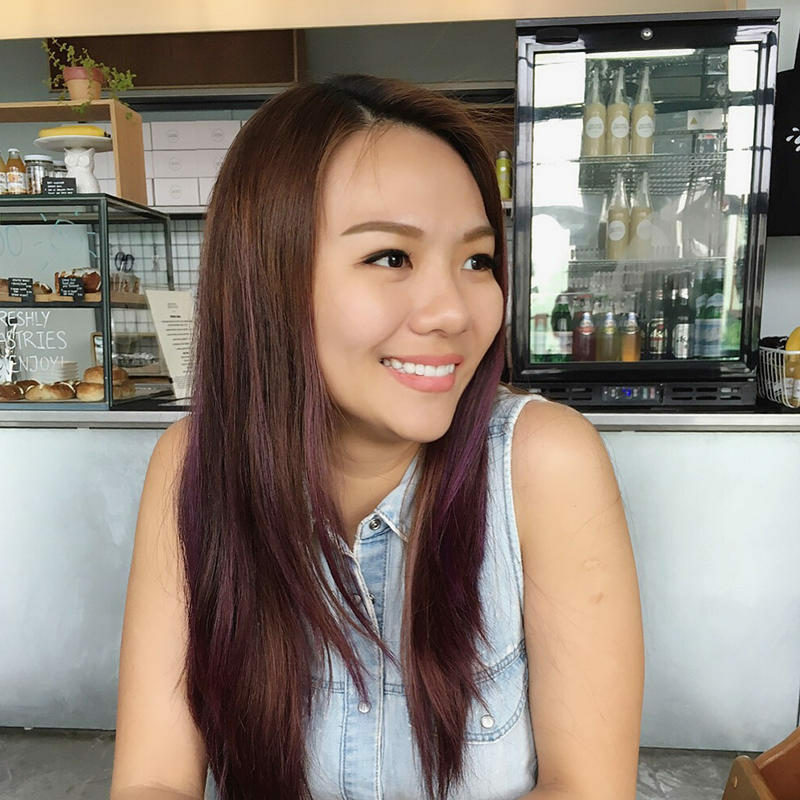 At 4, Daniel was mature enough to avoid crashing into anyone and rode on it from check-in all the way till we got onboard – that honestly provided a lot of relief to my husband and I. The wheels are of very good quality. The JetKids BedBox offers excellent maneuvering. I was very impressed with how easily it moves and swivels smoothly with little effort on my part. When we gave him the JetKids BedBox, we told him that he could pack his own luggage. He was ecstatic about it. Inside the JetKids BedBox is a roll up mattress and that takes up about half the box so there is some space left for Daniel to store items that he’d like to bring onboard the plane with him. I love that the BedBox doubles up as a small suitcase for essential items, but this time around, I let Daniel decide what he wants to bring. As as carry-on suitcase, it gave my boy the independence he craved for by allowing him to pack whatever he wanted on the plane. While this can be done with any bag, we loved that it was this multi-purpose BedBox. Have I also mentioned that this fits perfectly under the seat and in the overhead cabin? I love how this trumps so many other similar ride-on suitcases in the market. Economy seats aren’t the most comfortable especially for long haul rides but a comfortable and happy kid = happy parent = happy fellow passengers. The JetKids BedBox is also a patented children’s ride on suitcase that easily converts into a comfortable leg rest. As an inflight legrest, it really is a very comfortable leg rest for my child. He is rather tall for his age (110cm for a 4 YO) but it fit him well when he was seated upright and watching TV. It created more room and prevented his toys, snacks and books from falling. We also tried to let Daniel use it as a flatbed when he fell asleep. It comes with side cushions as you can see in the photo below to protect your child’s head from the hard sides of the seats. You can use the seat belt whilst your child is sleeping. I think my son was a little too tall for it to be used comfortably as a flatbed. I reckon kids who are below 90cm would fit PERFECTLY in this. My younger boy, Nathen is going to test drive this in June 2018 when we head to Phuket. I hope by then, he would be old enough to enjoy the ride-on feature. I also found this from Singapore Airlines website where they recommend the safe positions to use a convertible inflight beds such as the JetKids BedBox. You’d notice that you can only use it at seats where you won’t restrict safety evacuation. So in essence, to answer the big question – is the JetKids BedBox going to be useful enough to justify taking an extra piece of luggage with us on any trip?